One of my favorite things to do when traveling is to try local fare. I want to try independent restaurants and coffee shops and bakeries where someone who is passionate about the offering has invested in a place like none other. Maybe this is a way of being adventurous, or maybe it’s just plain food snobbery. Either way, I find great joy in tracking down unusual spots with incredible menus. Because of my foodie status, I’ve had food and drink that is so delicious, so astounding, it has left me speechless. There was the beef bourguignon souffle at Le Souffle in Paris and the broccoli, montasio, summer truffle at Frasca in Boulder and the chorizo-tamale hash at Flo in Chicago and the Vietnamese egg latte at CH3 in Bloomington. My taste buds have been treated over the years, the flavors and textures mingled with my memories, enhancing them, solidifying them. And in all cases, I have enjoyed these experiences with loved ones—usually always it’s Mike, but sometimes it’s other friends and family members. I remember all of it better because it is shared, it is celebratory, and it is togetherness. Sometimes I indulge in snacks or drinks on my own, but it’s rare for those to become distinct, powerful memories. The fare is typically lower-grade, and it’s consumed in conjunction with a hunker-down movie night by myself. Really, how exciting are Swedish Fish or mint M&M’s? They have their place, sure—but that mindless munching has nothing on a farm to table meal in Berlin that I’m sharing with my beloved. What we taste has immense power to shape life. Taste is integral in the life of faith too. Rituals and traditions in food and drink shape the lives of believers, connecting us to one another the life of the Church as a whole. It’s not just the physical intake though. Our souls need food too. We need to feast on truth and hope and joy if our spiritual selves are to function properly. 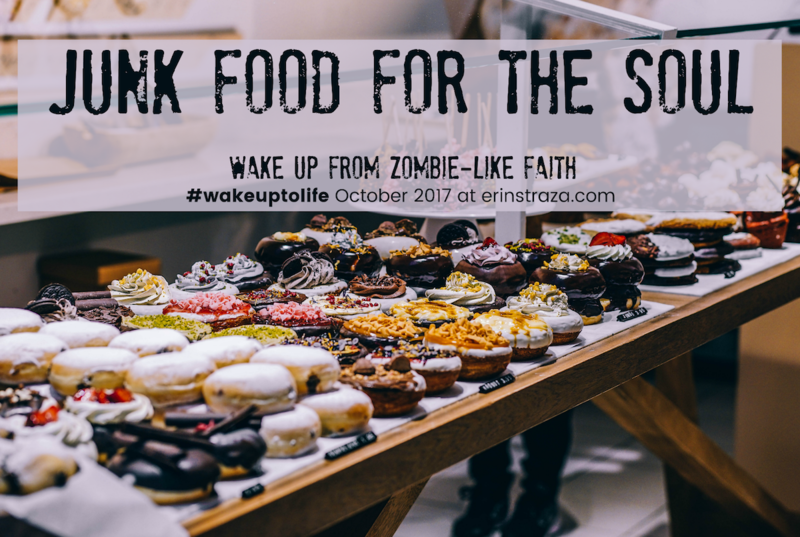 But when seasons of zombie-like faith hit? Our spiritual taste buds weaken; our desire for spiritual things fades. We feed our souls junk food. I’m curious… how’s your spiritual diet these days?